The press office of the Holy See has not released the complete text of the letter sent by Benedict XVI last February 7 to the prefect of the Secretariat for Communications, Monsignor Dario Edoardo Viganò. 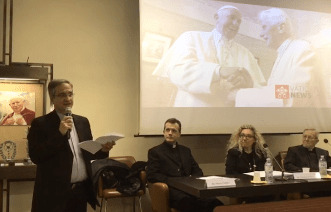 Viganò has, however, given it a reading (see photo) on the occasion of the presentation to the press of the series “The theology of Pope Francis,” published by Libreria Editrice Vaticana and made up of eleven booklets, by different authors, on various aspects of the written and oral magisterium of the current pontiff. The letter bears the date of February 7 and is in response to a previous letter from Viganò of January 12. But given that it was made known on the evening of March 12, just before the fifth anniversary of the election as pope of Jorge Mario Bergoglio, it was received as if it were a sort of “vote,” more than just good, given by Benedict to his successor, at the end of his first five-year term. This interpretation has also been fostered by the press release sent out for the occasion by Viganò himself, which cited only the second and third paragraphs of the letter. So here is the complete text of the letter, from the salutation to the final signature. I thank you for your courteous letter of January 12 and for the attached gift of the eleven small volumes edited by Roberto Repole. I applaud this initiative which is intended to oppose and react to the foolish prejudice according to which Pope Francis would be only a practical man devoid of particular theological or philosophical formation, while I would be solely a theoretician of theology who could understand little of the concrete life of a Christian today. The little volumes demonstrate, rightly so, that Pope Francis is a man of profound philosophical and theological formation, and they therefore help in seeing the interior continuity between the two pontificates, albeit with all the differences of style and temperament. It is difficult to understand how Pope Benedict could affirm anything at all about the books since he has not read them. It is becoming increasingly obvious that Pope Francis’s spin doctors have rather spin this out of control, and instead of adding credence to AL it has highlighted the steps his friends will take to add legitimacy to what is, in parys, grossly heretical.